Every sector in the world economy is being revolutionized by modern technology and retail is no exception. As a matter of fact, recent industry trends indicate that brick-and-mortar businesses stand to benefit significantly from new technologies (e.g. visitor analytics, heatmap, queue management devices, and many others) breaking into the scene. These new solutions provide business owners with data that outlines how much time visitors spend in their stores, how customers behave in the stores, and which products they interact with. As crucial as this data is, however, it comes mostly in the form of numbers, making it hard to interpret and apply. 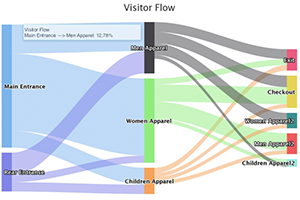 Which section of your store is receiving more visitor traffic than the rest? Why do customers spend more time in some sectors than they do in others? What practices are prevalent in these sectors, and how can they be used to upgrade the low-performing sectors? With the multi-camera heatmap solution, businesses can now measure customer dwell time from zone to zone. Afterward, the business intelligence platform provides them with reports on what makes certain sectors attractive to customers. This information can then be used to improve store design, optimize product placement, or make any other required changes. Data gathered from the devices can also be used to measure how much more sales were recorded when a product was displayed in certain areas. With this, business managers are able to test new product placement strategies and measure marketing ROI. Does the checkout counter at your store have long queues? Are there sectors that are so busy that they get overpopulated, leading to customer bottlenecks? The Business Intelligence Platform comes with a Visitor Flow feature that outlines the friction points in the customer’s purchasing process. Store managers can leverage this feature to improve customer flow in their stores and make purchasing as hitch-free as possible. The Business Intelligence Platform uses historical data to predict how different seasons and holiday periods affect how a store operates. Armed with this information, stores are able to operate efficiently and without compromising on customer satisfaction. For example, shifts will be automatically planned based on the number of customers entering the store and attendants are allocated based on the number of people in a section. Change in customer interests and how it affects staff scheduling will also be factored in automatically, using the time series feature made available by the latest machine learning solutions. At the start of every month/year, businesses set targets for traffic, sales, customer conversion, new products listed, and so on. Using the Business Intelligence Platform, it becomes easier to collate monthly data and measure performance against set targets. As a result, old strategies that proved ineffectual may be overhauled and new initiatives can be implemented to ensure that there are no shortcomings in the future. Businesses will also be provided with store-to-store reports outlining their monthly, quarterly, and yearly hit rate. 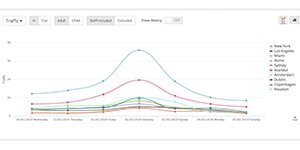 This allows store managers to access past data easily and track their performance over time. There are some parameters that differentiate one store from another. The Business Intelligence Platform aims to add these unique parameters as tags and filters, allowing users to make dynamic comparisons. Imagine being able to compare the performance levels of stores that share similar parameters with yours? For example, you can run a comparison of stores located in a certain city with a staff of 10-15, occupying an area of ~ 2,000 square feet, and paying about $5000 in rent. This feature will help store managers see how well their competitors are performing and which areas they need to improve in (e.g. marketing, product listing, in-store operations and so on). For companies with multiple business locations, the business intelligence platform provides an executive dashboard with information on how different stores are performing vis-à-vis customer traffic and conversion rate. If a store needs more traffic, that means marketing needs to be intensified and a low conversion rate is almost always indicative of poor in-store operations. Other features to be provided include Traffic-over-Rent and Rent-over-Revenue. These help decision-makers figure out which stores are profitable and viable. It also shows which ones are unproductive and need to be closed down or relocated. If, for example, you have a store (or sector in a store) for women in their 40’s but it is visited mostly by teenage girls, the conversion rate will surely be low since the teenagers are not the target market. However, when the Mood/Age/Gender (MAG) recognition technology is combined with the business intelligence platform, new marketing campaigns can be devised to target the demographics that you want. This makes it possible to attract only people of the right age and gender to your store, increasing traffic, conversion, and sales. V-count provides businesses all over the world with the technologies mentioned above (heatmap, visitor analytics, MAG) and a few others (queue management, people counting). Our clients use these technological solutions to compile visitor data and afterward, send it to our cloud-based business intelligence platform for storage and analysis. The intelligence platform then leverages the latest AI and ML tools to analyze the submitted data, presenting our clients with actionable reports that help them improve their business practices and get ahead of the competing pack. If you are interested in any of our solutions, please visit v-count.com or give us a call at+1-866-549-9360. We are available in over 110 countries and every prospective customer gets a free trial.